The Flood Fair reached out to San Rafael residents to: teach people about the flooding challenges San Rafael is facing, meet people who want to be part of the solution, hear what flooding means to residents, hear views, concerns, and hopes for a resilient San Rafael, introduce the Flood Mobile, explore some preliminary ideas, display young students’ work on the challenge. It was intended to capture a wide audience and generate awareness about the moral imperative and impending risks. 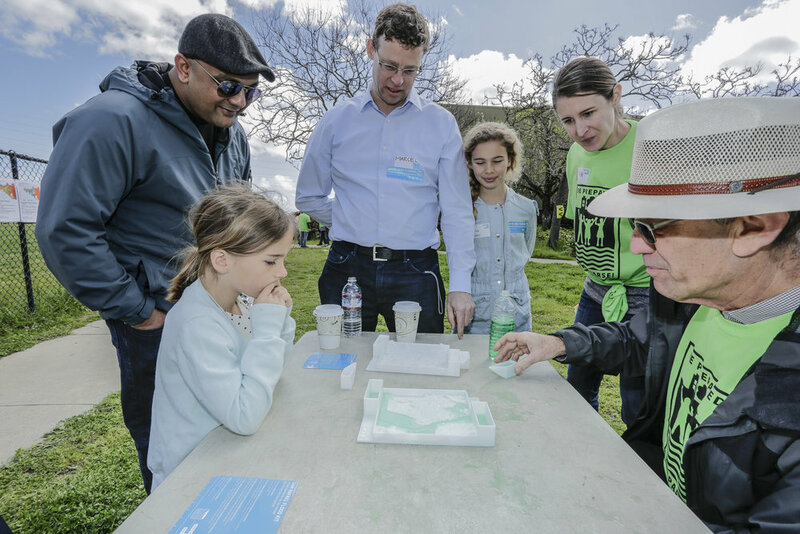 The Bionic Team worked with Shore Up Marin / Canal Welcome Center, Resilient Shore, Y-PLAN, and Youth in Arts to do outreach for the event. Host a flood fair to raise awareness about flooding in your community. Check out our resources section on our website for more information about Bay Area sea level rise datasets and maps. Include information on potential resiliency solutions, ways to be prepared for future disasters, and how residents can stay involved. Make sure to provide information in an accessible format to all residents in the local area (i.e. translated text, in person translation, age appropriate, etc).